Here is a photo of the seed pods of a very common prairie plant in Nebraska. I wonder how many readers can identify it? 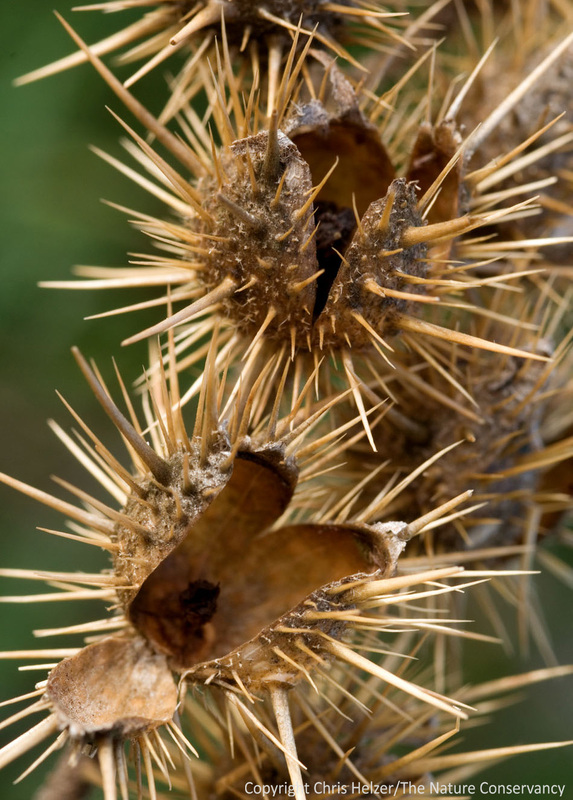 The spiny pods are approximately the diameter of a dime. The plant is buffalo bur (Solanum rostratum). It is a common annual plant found in disturbed areas in grasslands. In fact, it’s found in nearly every state in the United States. Buffalo bur is usually considered to be a weed because it can grow in abundance in areas that are overgrazed – partly because it is an annual plant with abundant seeds, and partly because the entire plant is spiny and not very attractive to grazing livestock. However, it is a native plant in Nebraska and has its own role to play. I wrote a previous post on the value of annual plants like buffalo bur and others, if you’re interested. As with many similar species, I use buffalo bur as an indicator that we’ve grazed a site hard enough to suppress the dominant grasses and open up space for seed germination. In addition to annuals like buffalo bur, that temporary open space also allows many perennial wildflowers to increase in abundance. As our grazing pressure shifts elsewhere in subsequent years, grasses recover their vigor, but some of the newly established wildflowers remain. You can find more information and photos of buffalo bur here at the US Department of Agriculture’s PLANTS database. This entry was posted in General, Prairie Natural History, Prairie Photography, Prairie Plants and tagged annual, buffalo bur, grassland, prairie, rangeland, solanum rostratum, weed by Chris Helzer. Bookmark the permalink. Hmm … Does it have big white flowers with yellow stamens in the center? Oh, I should have kept reading. I see you have identified it. I was thinking an Argemone. My little Springer Spaniel knows this plant. We call sand bur and find it only near Lake Michigan. We found some more in South Dakota last fall. Not a fun plant. Is it a dead version of a plant? All I know is that I have weed with thorns and yellow flowers and their buds look exactly like this…they are so hard to pull out, and when you do they grow right back!